However, if you think that Insidious is going to be anything like Saw you are sorely mistaken. Insidious is nothing like Saw and that is a good thing. After a decade of gore we need something else. I have come to believe that Saw, here me out on this, was an attempt to reckon with the Iraq and Afghanistan Wars. Let me explain: films are usually responses to current events. Film noire was a response to the growing female work force, post-World War II. Night of the Living Dead and early zombie movies were a response to the 60s Culture Revolution. True horror films always have a subconscious message about the times in which they were made. So, what does Insidious tell us about the times in which we live? 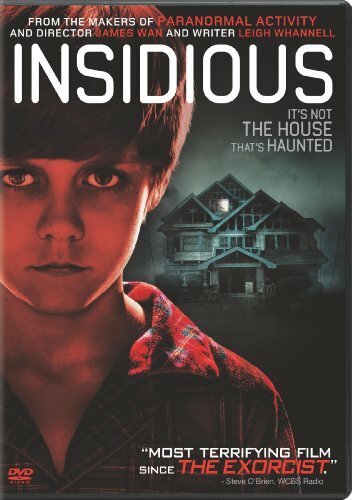 Before we answer that we need to discover what Insidious is and if you are reading this then you are ready for the review. Insidious tells the story of the Lambert family. Josh Lambert is a school teacher. Renai seems to be a stay at home mother. Dalton and Foster are two young boys and then there is the baby. They seem to be an ordinary family and on the surface they are, but there is something amiss. The setting takes place in a house that is obviously made out to look haunted. It looked like a nice house and I would love to own it. Here is a picture of it. During the movie, the Lamberts make their own in their new house, but as things begin to get scary they make a beeline for another house. The mother Renai believes that whatever is haunting the house is going to stay in the house. She has no idea that the ghosts are following them from house to house. This is a point that is revealed fairly early in the film so you aren't getting spoiled. Okay here is the big one, the synopsis, if you do not want to get spoiled than skip this section. The synopsis of Insidious is fairly complex and it is a setup for a sequel which was just released named Insidious: Chapter Two. In Insidious the oldest boy, Dalton, falls and hits his head. This causes him to go into a coma. The family take him to the doctor's, but they say that everything is fine with him. The parents hope that he will wake up, but after months he hasn't so they start to turn to other means to wake him up. During this time strange noises, creeks, and sounds have begun in the house. Renai becomes terrified when she starts hearing voices and seeing apparitions. We also learn that the father Josh is fearful of getting his picture taken and he hasn't in years. There are no child photos of him. Late in the movie we find out why. Josh is a skilled astral projector. An astral projector has the ability to leave his or her body and explore the cosmos in this film the projector is able to journey to the spirit realm named the Further. Eventually, the family panics after moving to a new house and the hauntings continue. Renai turns to Josh's mother who calls a family friend. Elise is a psychic like the lady from poltergeist and she will help the Lambert's find their son who we soon find out is stuck in the Further. Upon entering the house she discovers that Dalton is stuck in the Further and the spirits there are trying to capture Dalton's physical body. One entity is close and that is a demon. With the demon dangerously close to inhabiting their son the Lamberts try everything they can to save their son. The first thing they try to do is contact their son in the Further, but the demon is outraged. They contact him through a strange machine (pictured below). It looks like a gas mask to me but it is connected to one of Elise's scribes played by Leigh Whannell. Through the machine their fears are confirmed. Dalton is a prisoner to the demon and the only one who can save him is the father, Josh. Long ago, Josh was a skilled astral projector, but he had to stop traveling when a strange lady dressed in black came close to possessing him. Elise was the one who caused him to forget his past and he stopped taking photos because the entity was appearing in them. Risking his past connection with the lady in black, Josh decides to go into the further and rescue Dalton. Josh travels into the Further, which is a realm that spirits pass through after death. This is one of the creepiest parts of the film. You will be scared while watching this part. There are numerous ghosts and they crowd around the living, however they hold no power over the living so Josh is able to get into the house (where the demon is) and rescue his son. The demon does pursue him, but he is able to out run it and escape back to his world with his son. However, when he is giong back to his body he encounters the lady in black and I don't want to ruin the last few moments of the film, but let's just say that it sets up Insidious Chapter Two. The final moments of the film are gripping, but the film gripes you throughout. It is a roller coast ride of chills, thrills, scares, and monsters. I highly recommend it if you are a fan of horror and want something different than Saw.